UPDATED — The first stop for Pope Francis when he visits Philadelphia Saturday morning, Sept. 26, will be the Cathedral Basilica of SS. 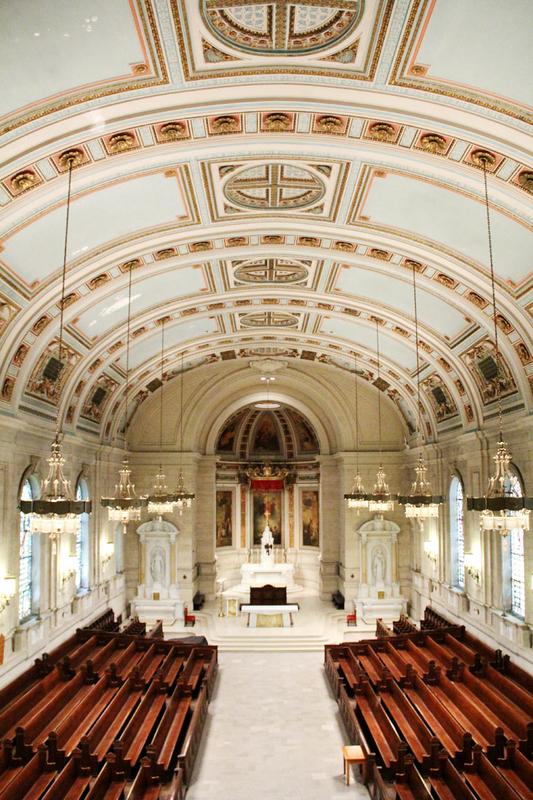 Peter and Paul to celebrate a special Mass for the people of the Archdiocese of Philadelphia. The previously unannounced Mass is part of the pope’s itinerary for his Philadelphia visit announced by the Vatican this morning, June 30. The announcement also included news of the pope’s planned visit with prison inmates of Curran-Fromhold Correctional Facility in Northeast Philadelphia. Another stop on the pope’s visit to Philadelphia includes a Saturday afternoon address at Independence Hall, birthplace of the Declaration of Independence and the United States Constitution. The pope is expected to speak about religious freedom and immigration, among other possible topics. The visit with incarcerated men, women and their families at the sprawling 25-acre facility, which houses 8,100 inmates in a complex of prisons, underscores Pope Francis’ commitment to extend mercy to the marginalized, including the poor, the sick and, in this case, the imprisoned. The pope has declared a Holy Year of Mercy in the Catholic Church beginning Dec. 8. It will emphasize the church’s healing ministry to all people “as a field hospital after battle,” as the pope has said. 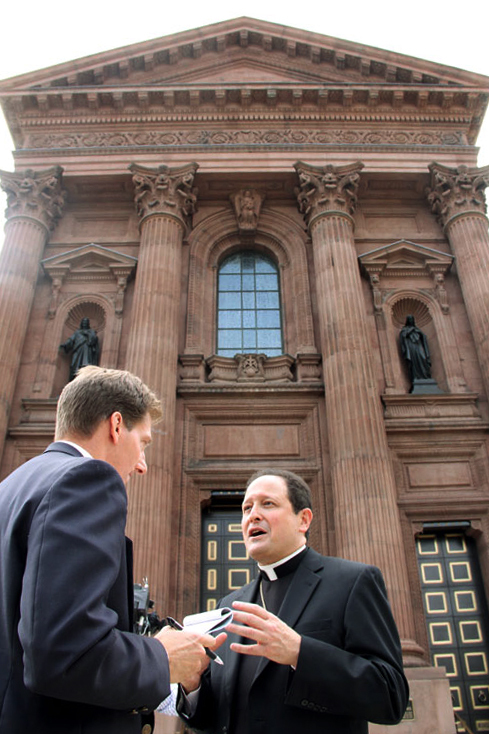 The morale of the Catholic community in Philadelphia has itself been battered from the past few years of crises including the sexual abuse scandal, financial troubles for the archdiocese and the merger or closing of dozens of parishes and schools. The visit of Pope Francis to the city and especially his celebration of a Mass scheduled in the archdiocese’s mother church, the cathedral, “is one of faith and charity, and his words and his presence will be a source of encouragement,” said Auxiliary Bishop John J. McIntyre during an interview June 30 at the cathedral. The iconic brownstone cathedral dating to 1864 only has a capacity of less than 1,500 for the Mass, plus seating for another 500 utilizing video monitors in an adjoining chapel. Bishop McIntyre said all priests in the archdiocese will be invited to concelebrate the Mass and deacons will be invited as well. 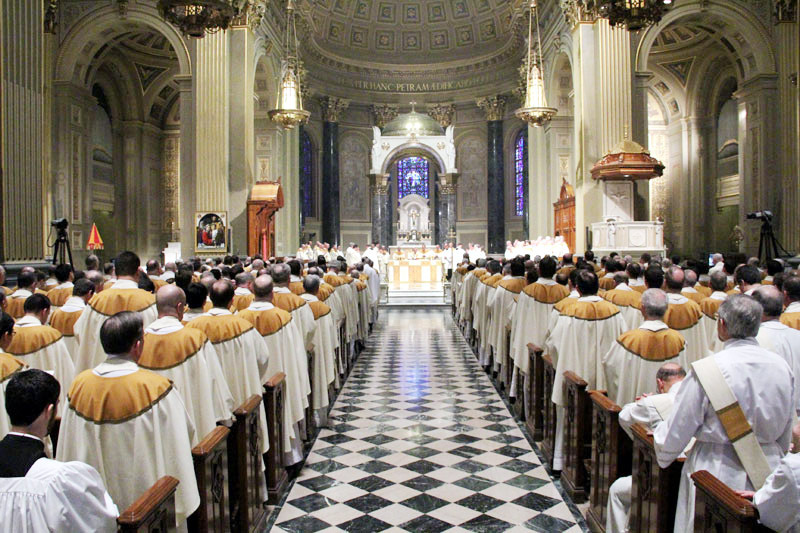 As of 2014, the archdiocesan Catholic Directory indicated there are 524 diocesan priests and 288 permanent deacons, plus 293 religious priests, though not all may be able to participate. He said that because of the great number of men and women religious in the archdiocese as well as lay people from the archdiocese’s 219 parishes, representative groups from each will be selected to attend the Mass, though the process for doing so was not yet available. “We hope and pray (the Mass) will be a boost to morale, (and) that it will be an instrument of God’s gift of faith and hope that we’ve been given,” Bishop McIntyre said. 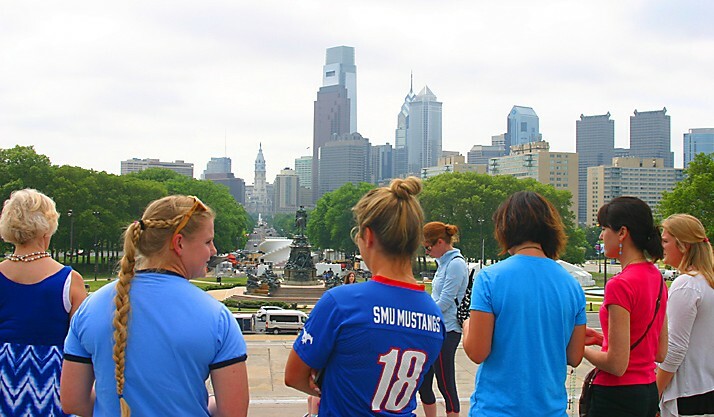 Both the Mass at the cathedral and the address at Independence Hall join other public papal events already announced for Philadelphia, including his attendance at the Festival of Families cultural celebration on Saturday evening, Sept. 26 and the public Mass he will celebrate on the Benjamin Franklin Parkway on Sunday afternoon, Sept. 27. 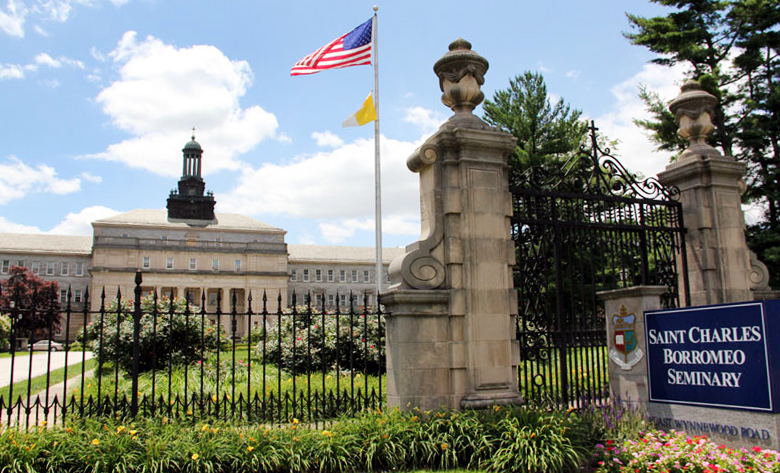 Private events include the prison visit and events at St. Charles Borromeo Seminary, located just over the city line in Wynnewood, where the pope will reside during his stay. The pope is scheduled to begin his stay with what is sure to be an exciting moment for seminarians when he greets them Saturday afternoon, Sept. 26, at the front steps of the massive College Division building. The pope will also utilize the seminary’s St. Martin’s Chapel the following morning for an address to the cardinals and bishops attending the World Meeting of Families. The World Meeting of Families in Philadelphia, which precedes the pope’s visit Sept. 22-25, is expected to draw some 15,000 participants from 150 countries. Pope Francis has called the congress “the central reason for his visit to the United States,” Archbishop Chaput said.